Rafael Nadal will have to wait at least one more day for a chance to complete his collection of Grand Slam titles after persistent rain washed out Sunday's US Open men's final against Novak Djokovic. For the third year in a row, the championship decider was postponed until Monday after foul weather ruined any chance of the match proceeding as scheduled. Rain began falling less than two hours before the match was due to begin, forcing a halt to the women's doubles final that was nearing completion in Arthur Ashe Stadium. About three and a half hours later, with no end in sight to the downpour, tournament officials decided to abandon play and reschedule the men's final at 4 pm (2000 GMT) on Monday. "Due to the continued uncertainty of the weather forecast for the remainder of the evening, and with the desire to be fair to the players and to our fans, the US Open men's single championship will be postponed until Monday," tournament organisers said in a statement. 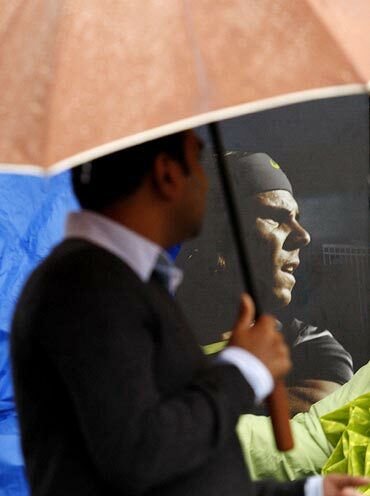 More than 20,000 people who had tickets for the match were forced to make a retreat while the delay stalled Nadal's bid to capture the one Grand Slam title that has eluded him. The Spaniard has already won the other three major titles during his career and a victory in New York would see him become just the seventh man to win all four Grand Slams. The world number one is an overwhelming favourite to win the title after cruising into his first New York final without dropping a set. But the delay gives an unexpected reprieve to Djokovic, who was left battling exhaustion after beating Roger Federer in a gruelling five-set semi-final on Saturday. The extra day of rest will give the Serbian a chance to recover after he endured a sleepless night. "I was watching golf and trying to sleep but because of the adrenalin I couldn't. I was walking around killing time," he told local television. "It's unfortunate rain stopped us but tomorrow is a new day. I will try to rest as much as I can and get some recovery. "I'm sure I will be fit to play my best tennis." 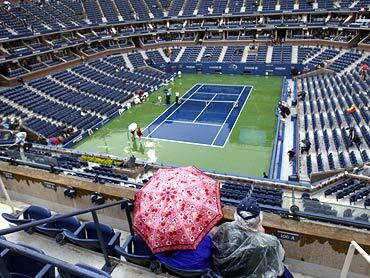 The postponement once again raised questions about why there is no roof over centre court at the US Open. 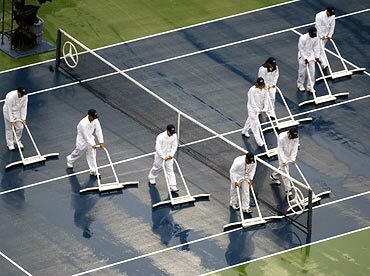 The centre courts at both the Australian Open and Wimbledon have retractable roofs while organisers of the French Open are in talks about covering up their main court. But US Tennis Association officials have balked at the idea because of the cost of covering Arthur Ashe Stadium, the largest tennis stadium in the world. "It's technically complex and financially challenging," USTA spokesman Chris Widmaier said. "At a cost of more than $150 million, do you spend that on a roof or continue to fund grassroots tennis programs in this country?"